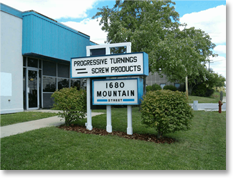 Progressive Turnings is conveniently located in Aurora, Illinois, with easy accessibility to I-88. The map below shows Progressive Turnings' location within about a 100 mile radius. The zoom control in the upper left of the map allows zooming in or out to see more area or more detail. Click the marker button to pop up a window for driving directions from your location. The window will automatically fill in Progressive Turnings' address, allowing you to fill in your own address and "to" or "from" that location.